I can't believe we're at the end of June. Where did it go! I've been taking photos of the garden all month, but things grow so fast that some of my shots are outdated already! For example, this one of my front yard herb and flower gardens. Everything's bigger, the calendula is blooming, and I've mulched. I'm happy to report that I have butterfly weed, rudbeckia, echinacea, and yarrow all coming up. 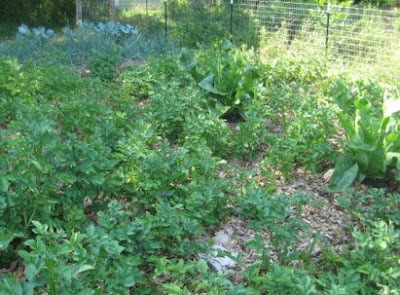 Here's the vegetable garden taken from the top corner. You can see cucumber hills at the bottom left corner, my double row of Swiss chard (short because it was recently cut) going across the photo, and behind that, bush beans. I planted most of my cool weather crops up here first, knowing they would get the advantage of same shade in the afternoon. My salad bed for example. The lettuce and radishes are done except for making seed, but amazingly, I'm still getting broccoli. The Queen Anne's Lace are volunteers for the good guy insects. 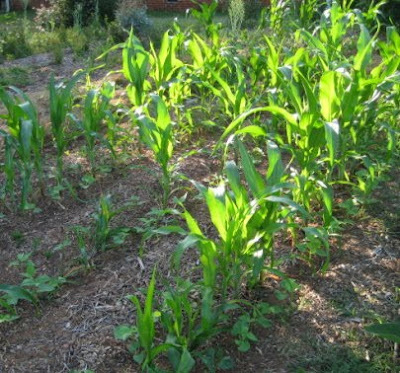 The big bare spot behind the sweet corn is where I planted amaranth. At least I hope these are amaranth! It has only sprouted sporadically as you can see. 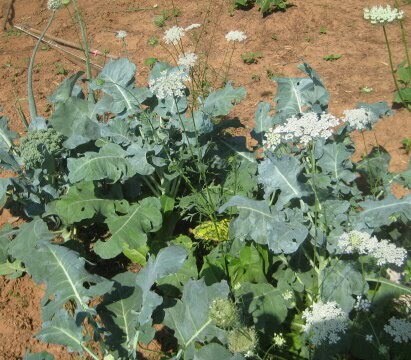 This plant is something new for me, but I want to collect the seeds as grain for the chickens. Sunflowers in foreground, corn in back on right, cantaloupe in back on left. Hidden by the sunflowers are yellow summer squash. 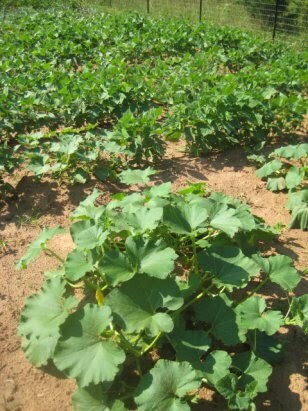 Cantaloupes are coming along nicely! I planted three hills of these, but the only ones growing are the ones I started early indoors. The direct sows have been a no show. Or else were eaten. I have plenty of watermelons, both from seeds planted indoors and those I later sowed directly into the ground. We greedily picked a few last week, which were not quite ripe enough. 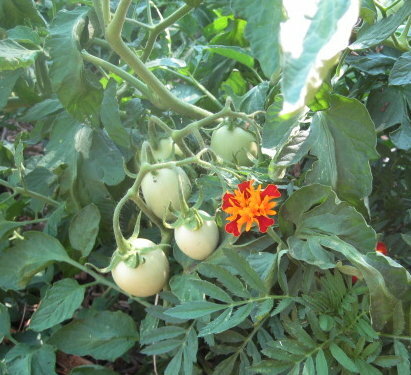 I have tons of Romas which will mean lots of sauce. The potted horseradish is going gangbusters. The ones I planted in the ground are wimps. The potatoes are mulched and doing well, though I had to throw away some plants with signs of blight, which seems to be spreading. This is frustrating because there doesn't seem to be a cure for blight, only preventative measures. Obviously I'm too late for that. I have two types of green beans. These are State 1/2 runners. Very tasty. I've canned 24 quarts (lost one though) and will let the rest go to seed. We'll save some of that for planting, but they are also used as a dried bean for soups. Buttercup winter squash in foreground. Black turtle beans behind. The buttercups are a deviation from my usual butternuts and acorns. The taste test will determine what I plant next year. They do wilt pretty badly in our midday heat. I need to offer protection to my squash plants next year. ... i.e. getting cardboard down as available, but not covering it except around the plants. Fortunately weeds aren't taking over in this garden. This is thanks to my grape hoe, but also I think, because we tilled it so many times: several times in different directions just to break the ground (which resulted in the death of our first tiller), twice before planting the annual rye cover crop, twice to till in the rye, and before each section was planted. Each time we raked out roots, grasses, and weeds, disrupting the weed cycle. The most difficult gardens I've had have always been where yard and grass previously existed. 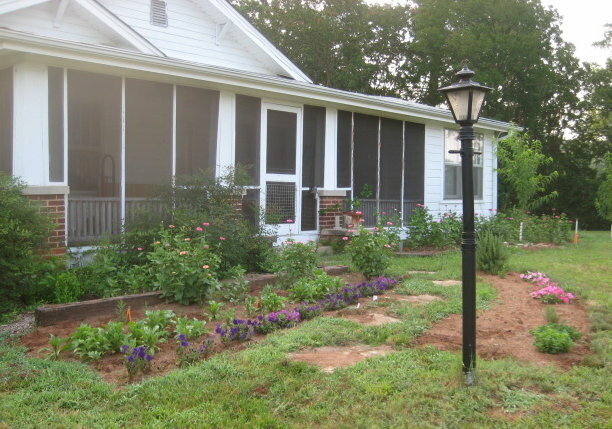 It is difficult if not nearly impossible to get rid of established grass. That's the problem I'm having with my strawberries and comfrey. Thanks to all the rain this year, the wire grass especially is insidious. And discouraging. So much so, that for my perennial garden (formerly last year's summer garden), I've succumbed to buying landscape cloth. Just between you and me, I feel that having to resort to this stuff is a defeat. 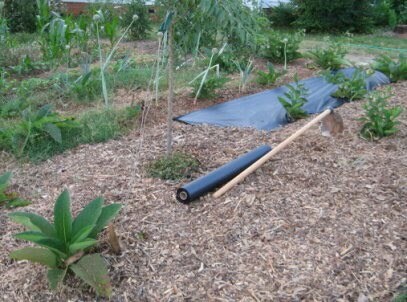 True, it will keep down weeds and keep in soil moisture, but mulch is supposed to decompose and build the soil. Landscape cloth doesn't do this and therefore isn't sustainable. Even so I've been surprised to find some organic gardeners endorsing the use of this and black plastic. That's bothersome, because it all points toward a current trend which is trying to redefine organic farming, gardening, and foods. For example, there's a movement (sample of how they're trying to sell the idea to the public here) to include GMO seed in organic food production. GMO seed is also not sustainable. 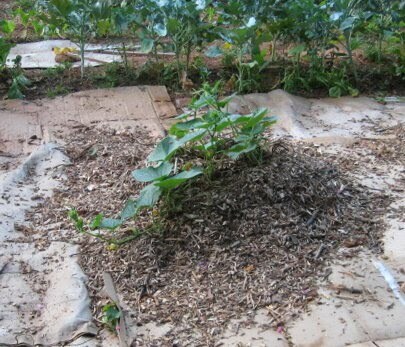 Anyway, I have mulched the strawberries and comfrey with newspaper, leaves, and wood chips, but to no avail. I weed out the grass and it comes back with a vengeance. I can either give up and lose the plants I want, make it a full time job to weed it, or do this. Sigh. Hopefully I can get the grass smothered out by the time the landscape cloth needs replacing. Lastly, the fruit trees we planted last fall. These are next to the vegetable garden (see master plan) We planted buckwheat in that section to begin building the soil and hopefully smother out some of those weeds. As you can see, the buckwheat is very sporadic and very few weeds are smothered out yet. 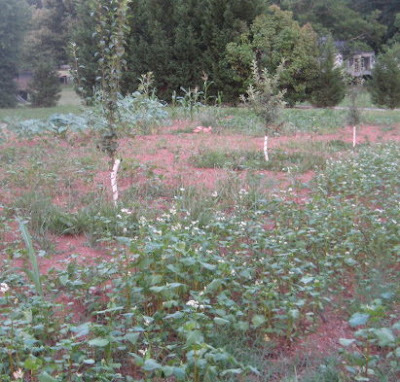 The plan is to till this in as green manure and plant an orchard grass/clover mix this fall. Whew. That was a long tour. Virtual lemonade and double chocolate brownies for everyone who made it to the end! I love garden tours, yours was lovely! I envy you your melons, mine are hardly past making their first clump of leaves... they haven't moved since...the squash are doing fine. 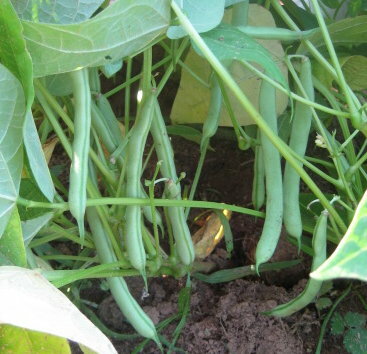 Its the great thing about green beans, if you miss the harvest just wait a little longer and you get dried beans, perfect for soup or traditional baked beans. Where did this month go? I have been wondering that myself. I really didn't realize that it was almost over until the other day when i had to write the date down and i was shocked to see 6-27-10! Wow! I wonder how you have time to do anything else? 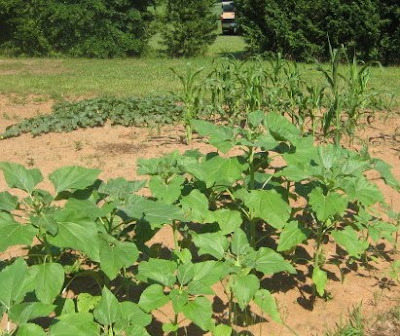 Your garden is beautiful - I'm amazed at all the stuff that you have already harvested - our beans are up but haven't bloomed yet - The pumpkins are all set on and the corn is looking pretty good, but it will be a while before we get any vegies. Nice job! T.
P.S. The only thing really big here so far are the mosquitoes! Quite a wonderful tour Leigh! Beautiful gardens and love the run down on how everything is doing. Such bounty, such hard work. Your garden looks so wonderful to me. It makes me want to get back to mine. 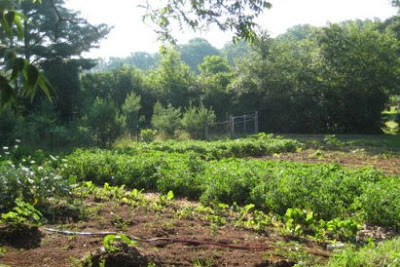 Your garden looks awesome and growing well! 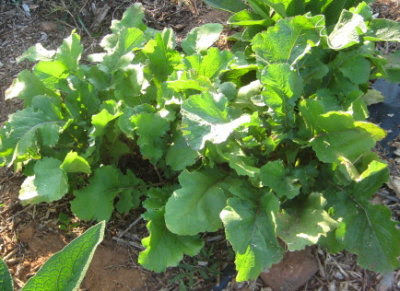 It is great seeing melons grow as I've not tried any yet as our season is a tad short and sometimes a little too cool. I'm envious of your beans though. I watch ours every day to check for them even to flower! Any day now, I'm sure. lots of progress! I have a similar problem with grass - and ground elder:(( whatever I do, it comes back with a vengeance... but even though ground cover isn't really "eco" - I think it's the only choice if you don't want to weed 24/7 forever! I wouldn't go for plastic though, I saw here that there are membranes/fleeces available made from recycled stuff. no good to loose your sanity over the invading grass! btw, there are some newer potato varieties available here, that show a very good resistance to blight, Sarpo Mira and Sarpo Axona. we have blight here every year, but those two have been going strong for me so far! I loved the tour and I will be right over I love brownies! It all looks so wonderful and I'm sure you are enjoying all the fruits of your labor! Your garden looks amazing...so big. You will no doubt have a very bountiful harvest this fall. I must say that I'm a bit jealous of those watermelons of yours, we never have much luck with them. What a great looking garden. It is so large! 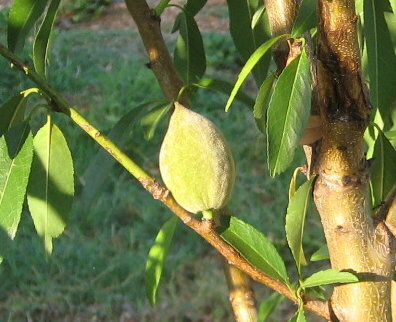 And those beautiful melons and an almond! Wonderful. Icebear, thank you!I'm glad I'm not the only one who thinks the month flew by. It seems to me that melons are just fussy. I can't figure out why my 2nd planting of cantaloupes did nothing, but I'm glad for the first at least. 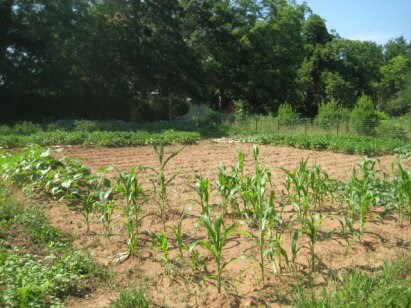 But Tina, when I'm lamenting that my garden is done, you'll still be harvesting? Carrie, I'm having some of the same problems though I did spray my tomatoes with a copper solution early, so perhaps they'll do better than the potatoes. I've got some bacterial wilt problems too, with my squashes. I usually try to follow the 1" rainfall per week rule. If there's less than that, I water. In the past I've used soaker hoses mostly, but did do ditch irrigation successfully with tomatoes one year. This garden is too big for the soaker hose, so I broke down and bought a sprinkler, because we're in one of our summer dry spells. Mulch of course, helps keep moisture in, but I didn't get everything mulched. Not that I still can't, but harvest and preservation are beginning to take up most of my gardening time these days. Bettina, fleeces! What a great idea! No seeds, slow to decompose, thick, water permeable. My dilemma is the strawberries, which need soil for their runners to take root and become new plants. Not sure how to handle that! Kathy, thanks so much. You purrs and prayers are coveted on our end. 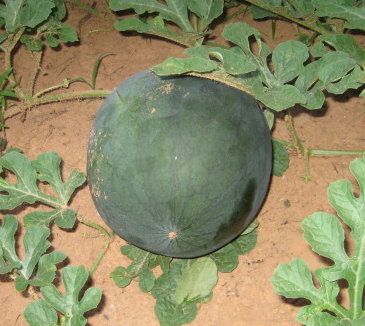 I really wish I had planted watermelon and cantelope now. They look so good - next year!! I'll take the lemonade, please. Great tour! You are going to have a great harvest this year and think how wonderful they are going to taste this winter when you are getting snow and freezing rain. The garden is looking great! What do you do with the grains you are growing? Are you milling those into flour for human consumption or using it feed the animals? Leigh, the strawberry runners are no problem! when you have the small plantlets formed, just fill small pots with soil, put the runners on top and fix the plant, with a hook, a small stone etc. when they have rooted, cut them off and you can carry the plant where you want them next... a bit more work than just letting them grow - but worth it, when you save time with all the weeding! Your garden looks absolutely wonderful! Sara, sounds like you've definintely caught the gardening bug! Good for you! 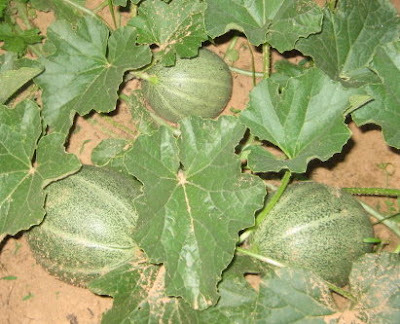 Yes, definitely put melons on your list for next year. LivingOurWay, yes, animal feed. 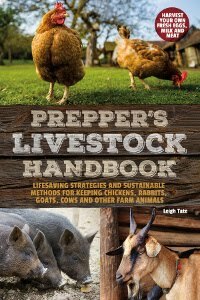 My goal is to hopefully feed our animals from the homestead as well as us. Protein is the big thing. 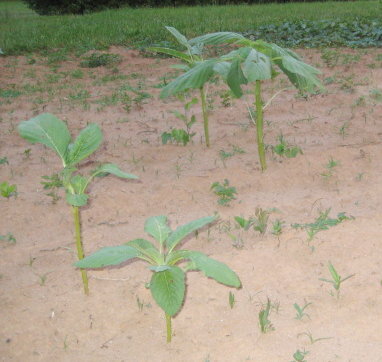 This year I'll have amaranth, sunflower seeds, and hopefully some field corn. Bettina, that's an excellent idea! 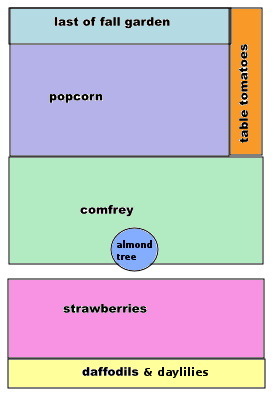 I've been thinking that my strawberry patch is too small anyway but since I put the comfrey in, haven't been sure where to go with it. Actually, maybe we should consider moving it altogether, covering that spot, and smothering the stuff out next year. Boy, you've got a lot going on! I'm envious of your melons. Up here, that won't happen until we get a hoop greenhouse or some such aide. With your knack for planning, I'm sure things will just get better every year so don't worry about what you may think of as a "defeat" this year. Think how far ahead you are of someone just starting out! We've always thought of Fourth of July as mid-summer. This year, I'M NOT READY!! Can we slow down time somehow? You make me want to pack up and move. That's just not possible where we live. I appreciate the farmers markets but it costs them a lot of money to come here and me a lot to buy from them. That means you're making a profit, on top of the satisfaction. Nice!! I just love seeing how you are doing. I put cardboard and newspaper on top of the grassy areas then we brought in loads of mushroom compost and dirt to fill the raised beds. No grass or weeds have infiltrated any of my gardens except (and this is annoying) the northwest corner (about 5 ft - no big deal in the general scheme of things) where the neighbors' do their lawn seed scattering and fertilizing and through the fence gaps the grass happily trespasses. I'm slowly getting a handle of this year's crop and it looks like the west neighbor is putting in a raised flower bed and the north neighbor's lilac is beginning to block the fence... maybe I can see the end to the turf war!! I'm thrilled with our tiny by your standards veggie garden. Every little bit helps, doesn't it? Beautiful and yummy at the same time. Just found your site and going through all your blogs and enjoying them very much. Was wondering what zone you are in, and how the buttercup squash ended up working out? Thanks; will continue following your progress. 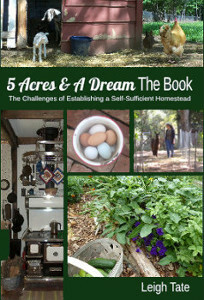 We are also empty-nesters now and have been "homesteading" for years, and your site is an encouragement. Therese, thank you! I appreciate your comment. We are in zone 7, and so are able to experiment with quite a few things. The buttercup squash did fairly well that year, though I lost a few in storage. I confess I've had problems trying to grow squashes including pumpkins. It's something I need to focus on next year.